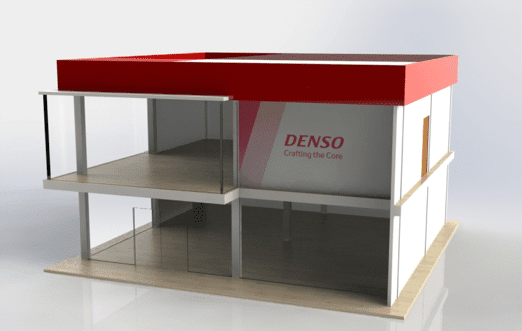 KARIYA (Japan) ― DENSO Corporation today announced that it will undertake a demonstration project aimed at training system integrators who can handle production and failure analysis equipment in Thailand by using a showcase production line for next-generation lean automation. The project was consigned by the Japan External Trade Organization (JETRO) to train lean automation system integrators (LASIs) in the “Connected Industries” as part of the “Project for Nurturing New Industries in ASEAN and Japan” promoted by the Japanese Ministry of Economy, Trade and Industry (METI) and the Thai Ministry of Industry (MOI). To achieve highly competitive manufacturing, it is essential to train system integrators who can build an efficient production system by eliminating waste in respective lines and plants through a combination of automation and information technology, in addition to developing and introducing automated production equipment. DENSO has introduced lean automation in its production process to eliminate waste and achieve an efficient automated production system. The showcase to be established in Thailand is a next-generation production line that combines lean automation refined by DENSO with “Connected Industries” promoted by METI. It will be established at the Industrial Transformation Center (ITC) within the MOI to provide open and practical learning opportunities to use cutting-edge systems. DENSO will also establish a consortium with the National Innovation Agency of the Ministry of Science and Technology of Thailand; five universities and one education facility in Thailand; seven local system integration companies, as well as Nomura Research Institute, Ltd. and LEXER RESEARCH Inc. The group will develop educational programs and teaching materials using the showcase, with training scheduled to begin in April 2018. Through the demonstration project, DENSO will train local system integrators who have practical capabilities to help enhance the competitiveness in the automation field. The project is regarded as a core project of Thailand 4.0 and will help increase the presence of Japan’s “Connected Industries” in Thailand, while accelerating automation of the local Thai and Japanese manufacturing industry, and enhancing DENSO’s manufacturing competitiveness in Thailand.